Light Dinner for a Hot Night! It was 90 degrees last week. Seriously, Winter?? What’s your problem? It’s March. Give it up, already. We get it… you’re cold. You’re blowing precipitation at us from every angle. You are the dominator, and we are gladly submitting into semi-permanent hibernation. But really… lighten up so we can give Spring a chance, okay? I’m confident that many of us have a similar conversation with the weather at some point during the cold months. But then, somehow, it all feels so far away when we get to late May and it’s 90 degrees and we’re sticky as soon as we wake up and all we want is for the humidity to give it a rest so we can stop sweating for like eight seconds please oh my gosh it’s so gross. Maybe it’s the Canadian blood in me. It’s true; I hail from the Great White North. And just in case you’re wondering: yes, we have summer up there, too. I even grew up in Chicago, which has brutal winters and summers. Somehow, I just never built up much of an endurance for the highest and most humid of heats. So, on an evening like last Thursday, after a long Crossfit workout, a bike ride, and some grocery shopping, the last thing I feel like is a big heavy meal. Racking my brain (and the shelves), for something both fulfilling, nutritious, and light, I proposed the idea of a spring salad to my loving fella. Here’s what we came up with. Plus any other fresh veggies or other salad add-ins you enjoy. We would’ve (obviously) chopped in some avocado if we had any. Prep your shrimp, defrosting and de-shelling under cold running water as necessary. Since this was a last-minute idea for us, we kept it simple and kept the defrosted shrimp in a bowl in the fridge with the juice of half a lime while we prepped everything else. Saturating the shrimp in a more complex marinade a few hours ahead of time would also yield some pretty great results. Another time, friends! Ok, so once the shrimp are prepped, it’s quite simple. Chop your veggies to your preference — I’m partial to tomatoes in half and cukes in little half moons — and set them in a big bowl with the greens. Then, get your dressing going in a separate small bowl or measuring cup. I’ve had a lot of fun experimenting with salad dressings (as well as mixers for things like canned salmon/tuna and sauces to go with quinoa and lentils), and this is one of those iterations. I think dressings can be quite personal, so my best advise is to play and experiment and see what you like in terms of balance and proportions. It’s all going to come down to some combination and harmony between oil, acid (vinegar/citrus), spice, saltiness, and sweetness. Start with the oil as a base, then add in about half that amount of liquid aminos. Keep in mind that stuff is quite salty, so you won’t need to add any to this dressing or really the entire meal. Then pour in a splash of the cider vinegar, squeeze in the juice of half of your citrus of choice, put in a small spoonful or two of mustard, and 1/8 teaspoon of cayenne and turmeric, each. Whisk it together and dip your finger in for a taste. Preferably the pinky finger. From there… meditate, sense, breathe, and trust in your intuitive wisdom. What’s needed? More acid? Put in more citrus juice or vinegar — I ended up using both lemon and lime. More spice? 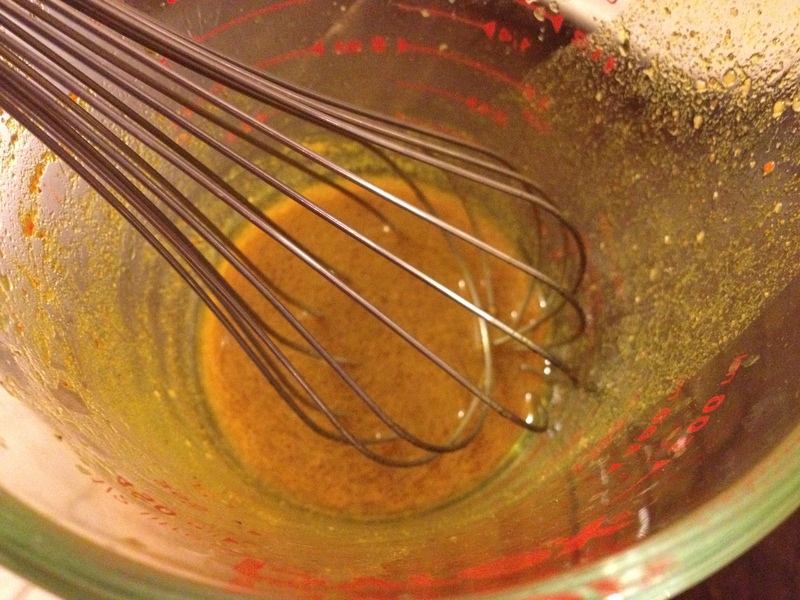 Add a hint of the mustard or cayenne. More oil? I don’t need to answer that for you. Go with your gut instincts. Now, here’s where things get a big tricky. And personal. Confession: We have a grill. Yes. A beautiful, propane, two-burner Weber grill. And a lovely Brooklyn back patio to barbeque on. It is an extremely fortunate situation that I am grateful for every day. I can’t emphasize that enough. So, now that you know, you can see where this is going. (Or maybe you noticed in the picture.) 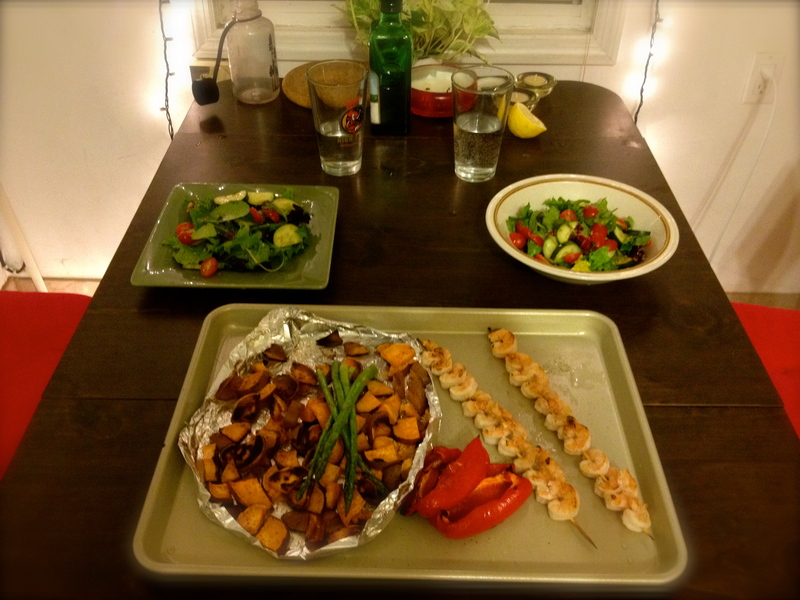 We grilled the shrimp on skewers. About 2-3 min each side. 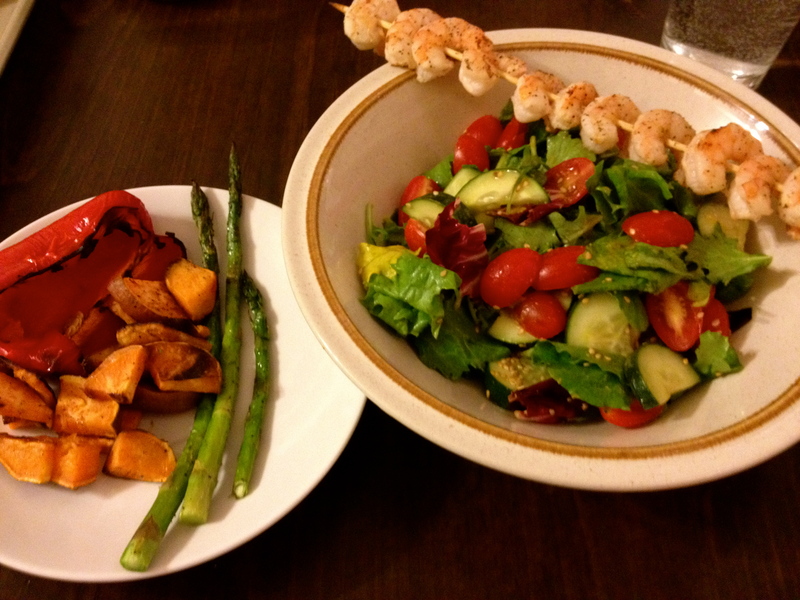 We also grilled a red pepper (cut in half), a loosely chopped sweet potato, and a few asparagus spears. But for the sake and simplicity of this recipe, let’s focus in, ok? For an added chef’s touch, roast the sesame seeds on the stove for a few minutes, stirring occasionally. Or if you’re tired/lazy/over it, then just throw them in. Mix everything together until well coated… greens, veggies, shrimp, dressing, and sesame seeds. Serve with a sweaty smile of accomplishment, and maybe a cold glass of seltzer with a wedge of lime. Mmm… cheers!